Map is showing Romania, a country in East Central Europe bordering on the Black Sea. Romania borders Bulgaria, Hungary, Moldova, Serbia and Ukraine, it also shares a maritime border with Turkey. With an area of 238,391 km² Romania is compared somewhat smaller than United Kingdom (242,900 km²), or slightly smaller than the U.S. state of Oregon. Romania has a population of 19.8 million people (2015), capital and largest city is Bucharest, with a population of 2 million people. Spoken language is Romanian (official). The country's geography offers roughly equally distributed landscapes of mountainous, hilly and lowland terrains. Romania's center is dominated by the Carpathian Mountains, located in this mountain ranges is also the country's highest point with 2,544 m, known as Moldoveanu Peak. Romania is home to the largest surface of virgin forests in Europe, most of them in the Carpathians, in particular the Southern Carpathians constituting Europe’s largest unfragmented forested area, but those forests are in urgent need of protection. According to the Greenpeace study, the deforestation dramatically increased between 2000 and 2011 and is ongoing until today. Long parts of Romania's south western border with Serbia and its southern border to Bulgaria is formed by the Danube river. Major rivers in Romania are Prut, Olt, and Siret river, they are tributaries to the Danube, also Romania's second longest river Mureș is a tributary to the Danube, but it flows to the west into Hungary where it meets the Danube. 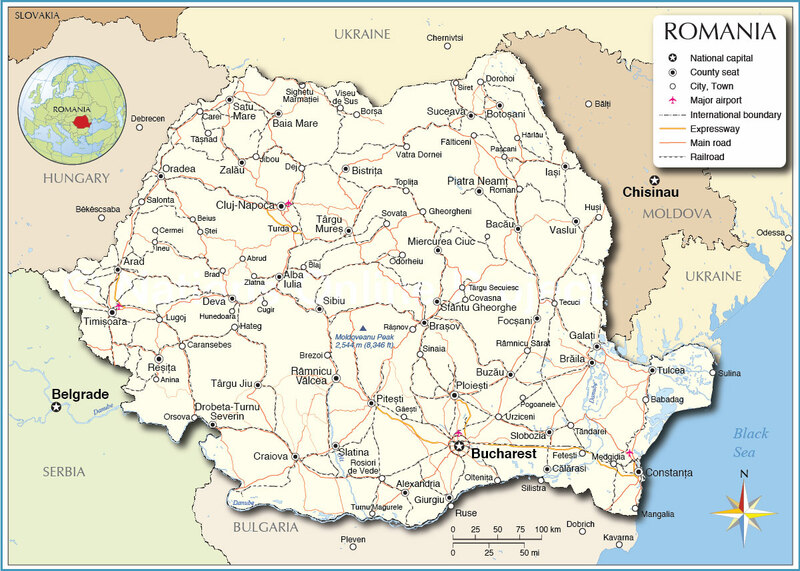 Depicted on the map is Romania with surrounding countries, international borders, major cities, main roads, railroads, and major airports. Bucharest's Henri Coandă International Airport (IATA Code: OTP) is the largest and busiest international airport in Romania. primary international airport in Romania). Bucharest (1,880,000), Romania's largest city and the national capital. Cluj-Napoca (325,000), second-largest city and the seat of Cluj County, known as capital of the historical province of Transylvania. Timișoara (320,000), the main economic and cultural center of Western Romania and the capital of Timiș County. Iași (290,000), capital of the Iași County, a university city and one of the leading centers of Romanian academic, cultural, and artistic life. Constanța (284,000), Romania's oldest city, primary port and capital of Constanța County. Craiova (270,000), capital of Dolj County and an important regional trading center. Brașov (253,000), seat of Brașov County. Galați (250,000), largest port town on the Danube River and capital of Galați County.